Posted on January 28, 2019 by Andy Higgs in Europe, Features, Germany, Places. I think it was the bread rolls that really brought it home to me. The sheer scale of the place was one thing, the madness of the entire concept another. But it was when our guide told us about the bakery that I truly understood how reality hadn’t been factored into these grandiose plans. How many workers would be required to produce fresh rolls for 20,000 people each day? In the 1940s? Okay, I think you need to back up a little there buddy. What? Sorry, let me start at the beginning. Early last year while surfing the web I came across an article about this place – an enormous holiday resort conceived by the Nazis but never completed. Located on the idyllic island of Rugen in former East Germany, it had been off the radar (and off the maps) for years as it was used by the DDR military. After the wall came down the unified German army took over before giving it back to the local council in 1990. The problem was what to do with it now – the reason it was in the news was that the biggest youth hostel in Europe was due to open in one of the renovated blocks and this was the subject of huge controversy – would it become a place of pilgrimage for neo-nazis? They like hanging out in youth hostels? No, that’s not the point…given the sensitivity of the period I suppose it was inevitable that there would be opposition, but if we are to abandon all buildings tainted by the Nazi era then there will be a lot of vacant office space in European cities. And this place was never completed either. True. Okay, so having found this interesting place you jumped on a plane? No. We were already planning a trip to Germany by rail and needed somewhere to break the journey from Berlin back to Ystad. Rugen has some great beach resorts, including Binz (which also has a station). I see. So you hijacked the family holiday to satisfy your fetish for abandoned buildings? Hmm, it sounds a lot worse when you put it like that. We all ended up happy – we had a hotel on the beach in Rugen with a pool, which was handy as it poured with rain the day I hired a bike and cycled to Prora. That’s another story. Back to this one – just 1.8 km up the pristine coastline from the resort of Binz is the “Colossus of Rugen”. 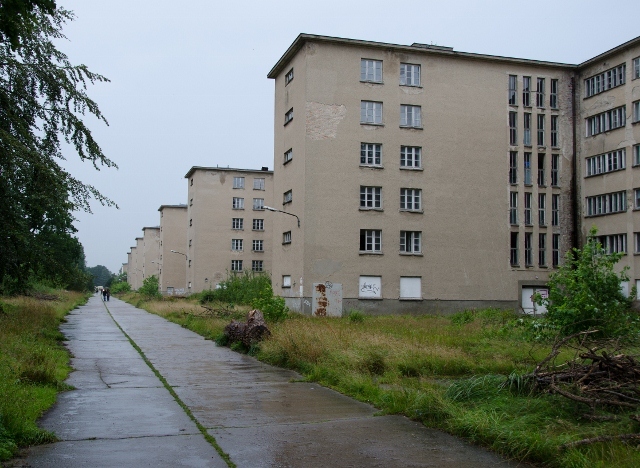 Here in Prora Adolf Hitler planned a seaside resort for some 20,000 guests – which if it had been completed would still today be the largest hotel complex in the world. The KdF (“Strength through Joy”) organization cleared a 4.5 km long building strip on which 5 accommodation blocks were to be built – each being some 500m in length. “Strength through Joy” was a subdivision of the German Labor Front whose main objective was to design leisure time for the German people, especially with regard to holidays. This would be a strictly arranged vacation with no free time – documents show each ‘holiday maker’ would be forced to follow a strict schedule. Hardly. The leader of the German Labor Front, Robert Ley, repeatedly stated that Hitler’s idea was to build five such KdF sea resorts, but Prora was the only one realised. Early in 1936 a competition was held in which 11 architects took part. Specific requirements were stipulated – all rooms must face the sea and the festival hall would have to be big enough for all 20,000 guests. Hitler himself allegedly chose the main design by the Cologne architect, Clemens Klotz with the central festival hall to be constructed according to the plans of Erich zu Putlitz. The foundation stone was laid with much aplomb on 2 May 1936, almost certainly chosen because it was the third anniversary of the crushing of the trade unions in German. The spectacle was broadcast on radio and included the participation of the Navy and Air Force. Robert Ley gave the main speech. Work continued steadily and by the summer of 1939, the accommodation blocks parallel to the beach and the skeletal construction in the middle were finished. Construction stopped as war broke out and resources were used for military purposes. Alongside the Nazi party rally grounds in Nuremberg, the KdF seaside resort in Prora is the largest architectural project of the time that was actually built, even if it was not fully completed. Yet it was also an important element of the National Socialists’ labour and social policy, serving its aggressive military and racial policies.The resort, allegedly planned as a place where ‘German workmen’ may rest and relax, was also intended to help in the preparation for war by strengthening the will of the people to fight and by pacifying the same workers who had been deprived of their rights. Individuality would be discouraged by the very size of the place and numbers of people it was planned to hold. Presumably fear prevented questions being asked of the project – could it ever really work? That’s where the bread rolls bit came in? Exactly. Not only that, could the buildings cope with the number of guests? What if you had room number 10,000 at the furthest end of the strip? You’d had to walk a couple of kilometers to get there. And how do you process 20,000 guests arriving on the same day? 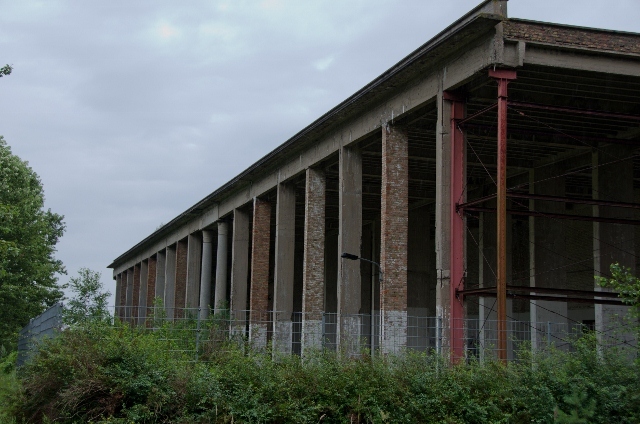 Two “Prora Symposiums” were held in 1994 organized by the NEUE KULTUR foundation whose members spoke out unsuccessfully against the attempted sale of the property. 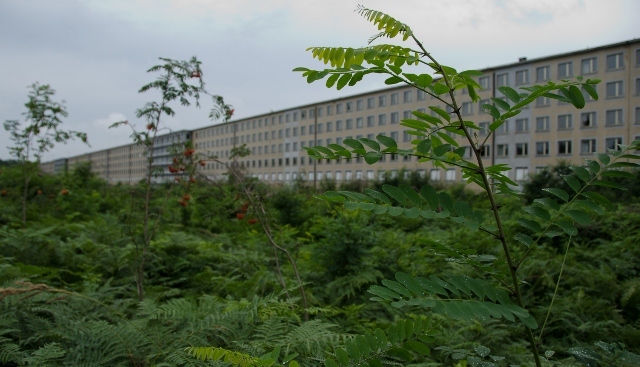 The central and most well-preserved sections (Blocks 1,2 and 3) in which the Documentation Centre Prora is situated were sold to private investors in 2004 who planned to develop a hotel, holiday homes, wellness centre and sport facilities. The economic downturn put a stop to these plans but the youth hostel has opened and proved extremely popular. The NEUE KULTUR foundation continues to use the facility and offers an excellent guided tour (in German) and exhibition (English and other language resources available). The future of the Colossus of Rugen remains uncertain. As our guide asked us, “What would YOU do with it?” It’s a good question. But first of all you really should visit if only to see what insane and unquestioned power almost managed to build. Really enjoyed your article – well written – and a succinct history of the building/s. You have to go to Prora to appreciate the size of the place – and it really does gives you a feel for the scale of the Nazi madness! Excellent interview-slash-article about Prora. I’ve never been to Rugen though I live in Germany. Thanks for submitting this post to Carnival of Europe – it goes live on 3rd Sept. See you there!